Quiet and Private, yet minutes to everything. Peaceful contemporary Asian-inspired studio cottage in quiet, urban neighborhood. Cottage is walking distance to excellent restaurants, movie theater, park, public transportation and only 6 minutes to Pearl District, downtown, yet extremely quiet neighborhood. On same property as my home which offers a separate entrance lower level apartment (vrbo #278095) which can be rented separately. Light and airy, ceiling fan, heated floors in winter, cool floors in summer with air conditioner, tiled shower, kitchenette with refer, sink, microwave, toaster oven, coffee maker, hot water maker, outdoor bbq (no stovetop--light cooking only) washer/dryer, flatscreen t.v./dvd library, wifi, skylight. Quiet and safe neighborhood with plenty of free on-street parking. Bicycle rentals, for extra fee. Storage space in garage for extra luggage, bicycles, etc Guests provided with snacks, coffee beans, teas. 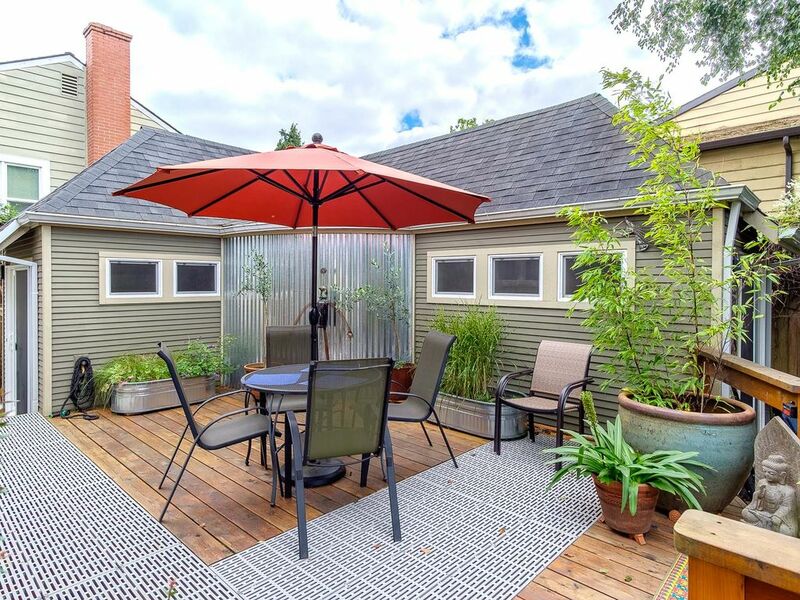 See why Frommer's Oregon calls this 'a gorgeous little hideaway'... Or check out reviews on trip advisor for Everett Street Guesthouse. Call for more information. I built this small lovely sleeping cottage in 2008. It gives guests privacy, as well as their own kitchenette, private garden, and larger shared deck.. I moved to Portland from California in 2004, where I ran a craft gallery for 10 years. I opened my inn in Portland in 2006 and have enjoyed meeting people from all over the world. I enjoy hosting people from all over the world. I enjoy kayaking, bicycling, movies and cooking, travel, exploring Portland.. .
A great place to call home while visiting the Portland area. Guests always say how great it is after a day of sightseeing, to have a quiet, relaxed place that isn't just a hotel room, to enjoy. Also the neighborhood has so much to offer, from movie theater to park to great restaurants...all within a 4 block radius, yet has a quiet, peaceful setting where you can relax after a busy day. Two comfortable chairs, queen sized bed, kitchenette and tiled shower. While I didn't purposely seek out this neighborhood when looking to buy a house, it just happened, and I'm so glad it did. Kerns isn't a very well known neighborhood, but it's walking distance to Laurelhurst and Buckman areas, which are better known. Only 4 blocks to NE 28th street, which is a restaurant/cafe mecca in NE Portland. Where can you get Cuban, Mexican, Italian, Mediterranean, New Orleans, Southern, Chinese, Japanese and artisan pizza in one location? Plus the Laurelhurst Movie Theater is a must, only $4.00 to get in and you can buyfood, beer/wine in the theater. And Laurelhurst Park is a mere 1/2 mile away and is one of the most beautiful parks in the area. Portable air conditioner, though unless it's up in the 90's, the floor, ceiling fan, and low windows on one side keeps it nice and cool. under floor heating and also a small electric heater if needed. Fresh linens and towels provided. No daily room service. No "parking" garage, but garage for storage of bicycles, luggage or anything you'd like to store while here. some initial food items to get you started--butter, cereal, coffee beans, teas, bread or english muffins, and other items. fat tire 18 gear bicycles for rent @ $15.00 per day per person with locks and helmets. Private entry patio plus private back garden patio as well as a large shared deck with the B & B on the same property. Glad you enjoyed it. It was a pleasure hosting you. Wonderful stay in this cozy cottage. Fantastic location, great host. Thank you! Thank you! Enjoyed having you both. Come back again. My first visit to Portland to visit my son and daughter in law after their move. Was lucky to find this cottage that was close to their home. The cottage was very comfortable, quiet and clean. Owner, Terry had it well stocked with snacks and toiletries. I will look to stay there again on my next visit. Thanks Virginia. Enjoyed hosting you and so glad it was so near to your son's family. Hope you'll come another time. Comfy, great location with welcoming owner and plenty of privacy. Would stay again! A great find in Portland! We stayed at the cottage for four nights. Terry has done a great job of creating a comfortable getaway. The cottage has every necessity, was clean and inviting, and has lovely outdoor space. The bed was so comfortable that I slept 11 hours the first night! Convenience to transportation and restaurants was also a big plus. Thanks so much! I know how important sleep is on a vacation, so glad you slept well. Great meeting you both and hope you'll be able to return to Portland in the future. Kerns is a lovely neighborhood that's only 5 minutes across the Burnside Bridge to downtown, yet quiet and residential. A few minutes walk takes you to NE 28th, known as 'restaurant row', as well as Laurelhurst Movie Theater, $4.00 to get in and food and beer--what's not to like? There is a 3 night minimum, but if only 2 days are available up to owner's discretion. Non smoking and no perfume environment. I accept check, cash, credit card, paypal or google wallet. Deposit of $100.00 is due to hold any reservation. Your deposit will be by credit card, but if you wish to pay your balance with check or other method, let me know. Also please let me know what time you would like to check in (any time after 2:00) so I'll be on site. Thanks and looking forward to your stay.